Commentary: How Do We Get The World To Notice Africa's Women Scientists? : Goats and Soda The author, a woman scientist from Africa, was stumped by a survey asking her to name women scientists from Africa. I discovered Mbu Waindim, an aerospace engineer from Cameroon who's passionate about politics and gender issues; Farida Bedwei, a software engineer from Ghana who did not let cerebral palsy affect her work; and Sandra Owusu-Gyamfi, Ghana's first amphibian biologist. I understand why I had a hard time naming African women scientists. There is no one-stop source showcasing their work and, as I live in the United States, it was easy to fall behind. At the same time, many African women scientists lack the global recognition they deserve. Like much of the world, the African continent has yet to achieve gender parity for science researchers. According to the UNESCO Institute of Statistics, women comprise only 30 percent of professionals in the sciences in sub-Saharan Africa. This under-representation in STEM puts a brake on progress toward sustainable development. Africa needs the skills and perspective of women scientists to address challenges such as climate change, food insecurity and water scarcity. Women are key players in developing science-based solutions to improve lives and generate inclusive economic growth that benefits society as a whole. 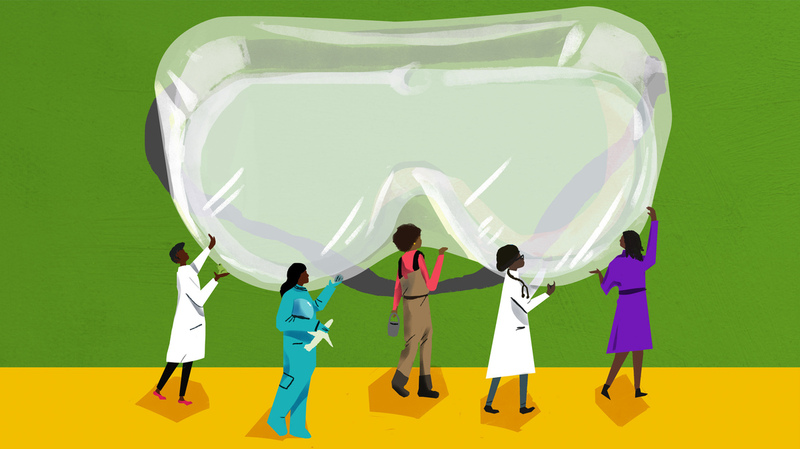 Knowing there are so many African women scientists raises the question: What can we do to make sure Africa, and the rest of the world, knows about them, too? Create an inventory of African women scientists. Technology makes it easier to map what exists. Through crowdmapping, which combines geographic data with real-time input from social media feeds, text messages and other sources, we can track the representation of African women scientists. Such an inventory would make these women more visible and allow African countries to utilize them. It also would connect women scientists to one another, fostering collaboration. And crowdmapped data would help policy makers identify areas to target for intervention. Coordinate existing efforts that highlight African women scientists. There is no dearth of organizations, institutions and online platforms working to close the STEM gender divide on the African continent. To name a few: The African Institute for Mathematical Sciences, African Women in Science and Engineering, Levers in Heels, The Exploratory, African Women in Agricultural Research and Development and AfroScientric. While they have a common goal, there is little coordination among them. In harmonizing their efforts, the groups could better elevate the contributions of women scientists and harness their research to advance Africa's development. Create an annual gathering for all African women scientists, regardless of discipline. Many scientists belong to professional organizations tied to their disciplines. These organizations hold annual meetings where members present their research and meet other researchers. An annual gathering for African women scientists, irrespective of their fields, would allow them to build networks, meet potential collaborators and discover how others have tackled various challenges. Create more prizes to reward African women scientists. We need more prizes and other ways to reward and celebrate Africa's top-performing women scientists. This would show that Africa cares for its women scientists and will support their work. In 2010, the African Union honored five outstanding African women scientists — why isn't that an annual event? Continue to highlight these role models. One of the most-frequently cited reasons that there are too few women scientists is the lack of role models. Therefore, it is important to continue highlighting those already making their marks. Efforts like those of Levers in Heels should be encouraged and funded — and taken further, perhaps with a TV or YouTube channel that exclusively highlights such women. I know I'd watch "Africa's Next Top Amphibian Biologist." Esther Ngumbi is a post-doctoral researcher at Auburn University in Alabama. She served as a 2017 Clinton Global Initiative University Mentor for Agriculture and is a 2015 Food Security New Voices Fellow at the Aspen Institute. Reach her @EstherNgumbi.